BACKGROUND AND PURPOSE: Little is known about the mechanical stabilization afforded by new materials proposed for use with vertebroplasty. This comparative ex vivo biomechanical study was designed to determine the strength and stiffness of osteoporotic vertebral bodies (VBs) subjected to compression fractures and stabilized with bipedicular injections of Cranioplastic altered in a manner consistent with the practice of vertebroplasty or BoneSource cement. METHODS: VBs T8–T10 and L2–L4 from 10 fresh spines were harvested from female cadavers (aged 91.5 years ± 3.9 at death). These were screened for bone density (t score, −4.9 ± 1.4; bone mineral density, 0.61 g/cm2 ± 0.19), disarticulated, and compressed to determine initial strength and stiffness. The fractured VBs were stabilized with bipedicular injections of a predetermined quantity and type of cement and then re-crushed. RESULTS: At both the thoracic and lumbar levels, VBs repaired with altered Cranioplastic resulted in significantly greater strength (P < .05) than that in their prefracture states, whereas those repaired with BoneSource were restored to their initial strength. Cranioplastic resulted in significantly stronger repairs than BoneSource in the thoracic region; however, repair strengths in the lumbar region were not significantly different. The repaired stiffness was significantly lower than the initial stiffness in all treatments and in both regions. Differences in the repaired stiffness between the treatment groups in either region and differences in the mechanical parameters obtained by adding an additional 2 mL of BoneSource were not significant. CONCLUSION: Both materials in the volumes used either restored or increased VB strength, but none restored stiffness. The primary indication for vertebroplasty is a painful osteoporotic vertebral body (VB) compression fracture (1). Pain relief obtained with the procedure appears to result from mechanical stabilization of the fractured VB rather than from chemical or thermal damage to periosteal nerves (2). Thus, the design criteria for new cements should include the provision of sufficient mechanical support, radiopacity, and ease of injection. New injectable materials that address these criteria are being developed; these include polymethylmethacrylate cements with altered compositions (ie, increased opacification, increased monomer-to-powder ratios) (3, 4), bioactive glass cements (5), and bioresorbable cements (3, 6, 7). Although the bioresorbable cements have the theoretic advantage of being naturally radiopaque (4) and more biocompatible, they are typically more difficult to inject (7), require more time to cure, and are weaker than their acrylic cement counterparts. The problem of injectability has recently been surmounted, but concern about the mechanical properties remains (3). An ex vivo study comparing VBs mechanically augmented with BoneSource (Stryker Leibinger, Kalamazoo, MI), a hydroxy apatite cement; Simplex P (Stryker-Howmedica-Osteonics, Mahweh, NJ), a polymethylmethacrylate cement; and an altered form of Simplex P showed that BoneSource resulted in significantly weaker and more compliant repairs compared with those achieved by using either form of Simplex P (3). Although Simplex P and its altered form are substantially stronger and stiffer than the altered form of Cranioplastic (CMW, Blackpool, England) used clinically for percutaneous vertebroplasty (PV) (4), the altered form of Cranioplastic results in satisfactory clinical outcomes (8) and may be a more appropriate benchmark against which to measure the mechanical stabilization provided by BoneSource. Therefore, the purpose of the current study was to compare the mechanical stabilization provided by BoneSource with that provided by the altered form of Cranioplastic. The authors hypothesized that 1) strength and stiffness do not differ between VBs repaired with BoneSource and those repaired with equal volumes of altered Cranioplastic and that 2) VBs repaired by using 2 mL more BoneSource than the volume of Cranioplastic results in significantly greater strength and stiffness than that of VBs repaired with Cranioplastic. Six VBs (T8–T10 and L2–L4) from each of 10 fresh spines were harvested from female cadavers (mean age at death ± SD, 91.5 years ± 3.9; Maryland State Anatomy Board, Baltimore, MD). Rice bags were placed beneath the spine to provide 16–18 cm of soft tissue surrogate (9). The region of interest was L2–L4, and it was evaluated for osteoporosis (mean t score ± SD, −4.9 ± 1.4; mean bone mineral density ± SD, 0.61 g/cm2 ± 0.19) by using the dual-energy x-ray absorptiometry method (DPX-1Q, Lunar Corp., Madison, WI). The vertebrae were disarticulated, their disks excised, and the posterior elements removed to facilitate mechanical testing. With a Latin square design, the VBs were segregated into two groups of three vertebral levels: the thoracic group (T8–T10) and the lumbar group (L2–L4). Within each group, the VBs were assigned to one of three treatments: 1) CR, Cranioplastic; 2) BS, BoneSource; and 3) BS+2, in which 2 mL more BoneSource were injected than in the CR or BS groups. In this manner, the number of VB specimens from each level and each spine were evenly distributed among the cement groups, and the effects of donor and vertebral level were minimized. An impression of the endplates of each vertebra was made by using a common dental acrylic (Fastray; Bosworth, Skokie, IL). The VBs were wrapped in saline-soaked gauze, sealed in plastic bags, and stored at −20°C until the day before testing. All specimens were thawed at room temperature (20°C) 24 hours before testing. Each VB was floated in its sealed plastic bag in a water bath maintained at 37°C for at least 1 hour before mechanical testing. Just before testing, anterior, posterior, right lateral, and left lateral VB height measurements were made by using digital calipers accurate to 0.01 mm (Mitutoyo MTI Corp, Aurora, IL). Each VB was then seated between its respective impressions, which were placed between platens on a materials testing machine (Instron, Canton, MA), and preloaded in axial compression to 20 N for 10 seconds. Each was then compressed via the superior platen at a rate of 5 mm/min to 25% of its initial height or until failure occurred, whichever came first (10). Failure was defined as a decrease in load with increasing compression (inflection point) of the VB. 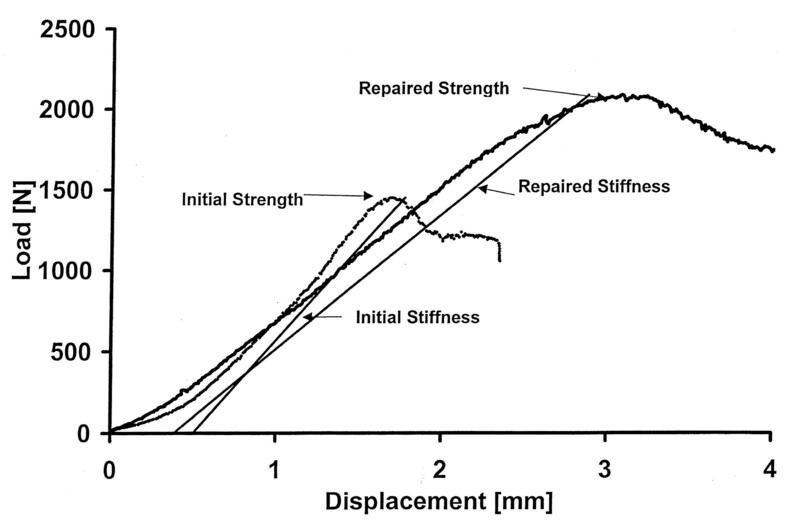 Force and deformation data were recorded at 10 Hz, and the initial strength and stiffness of the VB were measured (Fig 1). Strength was defined as the peak load (load at failure), and stiffness was defined as the slope of the force-versus-deformation curve between 448 and 1112 N (11). Typical force-versus-deformation response curves for VB T9 compressed initially and after repair by using 6 mL of BoneSource. After the simulated compression fracture was created, an 11-gauge cannula was inserted through each pedicle. For VBs in the thoracic group, a bolus of 2 or 3 mL of the appropriate material was injected through each needle into the interior of the VB, resulting in a total interior fill of 4 or 6 mL. For thoracic VBs in the CR or BS group, a total of 4 mL were injected, whereas in the BS+2 group, a total of 6 mL was injected. For VBs in the lumbar group, a bolus of 3 or 4 mL was injected through each pedicle for a total fill of 6 or 8 mL. Lumbar VBs in the CR and BS groups received 6 mL; those in the BS+2 group received 8 mL. Total fill volumes used were based on the amount of cement needed to restore strength within a given region, as reported elsewhere (12). VBs in the CR group were injected with Cranioplastic, modified by removing two level tablespoons of powder and replacing them with two level tablespoons of BaSO4 (approximately 8 g) (8). To this powder was added the complete 17-mL vial of monomer liquid, yielding a cement with a 26% BaSO4 content by weight and a monomer-to-copolymer ratio of 0.73 mL/g (4). To prolong the working time, the components of the Cranioplastic were chilled to 4°C for a minimum of 24 hours before mixing (by hand). The BoneSource for the BS and BS+2 groups was prepared by mixing a 10-g vial of BoneSource powder with its accompanying 5-mL vial of 0.25 mol/L sodium phosphate solution. To this mixture was also added a 200-mg vial of carboxymethylcellulose powder (Putty Additive; Stryker Biotech, Hopkinton, MA). The methylcellulose solution was used with BoneSource to facilitate the injection of the cement through the cannulae and its infiltration into the VB bony structure (3). The cement components were stored and mixed at ambient temperature (approximately 20°C). BoneSource is naturally radiopaque; therefore, no additional opacification was required (Fig 2) (4). Radiographs of VB L2 injected with 6 mL of BoneSource (top), VB L3 injected with 8 mL of BoneSource (middle), and VB L4 injected with 6 mL of Cranioplastic opacified with barium sulfate (bottom). After injection, each VB was wrapped in saline-soaked gauze, sealed in a plastic bag, and floated in a bath maintained at 37°C for 24 hours to simulate physiologic conditions and to allow the various cements to cure. Immediately before the subsequent compression test, the VB heights were measured as mentioned previously. VB specimens were then recompressed according to the initial crush protocol outlined previously. Stiffness was calculated as before. Strength after repair was defined as the maximum load, which occurred within the first 6 mm of compression (12). On average, 6 mm equaled 25% compression, which is one radiographic diagnostic criterion for vertebral compression fractures (13). We checked for an effect of treatment on VB stiffness and strength by using a repeated-measures analysis of variance (ANOVA). Each set of three VB levels from each spine was assumed to behave homogeneously. The factors were treatment cement (CR, BS, BS+2) and condition (initial vs repaired). A Tukey post hoc comparison test was conducted to determine if the differences were significant. Unless otherwise specified, all differences were considered significant at P < .05. Data for the thoracic group were analyzed independent of those for the lumbar specimens. For thoracic and lumbar VBs, no significant difference was noted in the initial strength and stiffness parameters among their three respective VB levels (Tables 1 and 2). This finding suggests that, within a given region, the VBs behaved as a homogeneous sample. After treatment, VBs in both the thoracic and lumbar regions were significantly more compliant (less stiff) than they had been in their initial states. Repaired VB stiffness was not significantly different among the three treatment groups. With regard to strength, thoracic and lumbar VBs injected with Cranioplastic were significantly stronger than they were initially, whereas the post-treatment strength for VBs in both the BS and BS+2 groups was not significantly different from values obtained in their intact states. Furthermore, Cranioplastic treatment resulted in significantly stronger repairs than either the BS or the BS+2 treatments for only the thoracic region. Initial and post-treatment strengths for VBs were the same in the BS or BS+2 groups in both regions. For thoracic and lumbar VBs, treated specimens reached failure load with significantly greater deformation than specimens in their initial state. However, differences in failure deformations between treatment groups were not significant. Two VBs, one in each of the regional groups, were mistakenly treated contrary to their pre-assignment group. Although the number of specimens in each group was 10, the treatments were not evenly distributed among vertebral levels. In the current study, the mechanical responses of simulated osteoporotic vertebral compression fractures repaired with two cements were compared. The treatments restored or increased VB strength but did not restore VB stiffness to the initial levels. No significant difference was noted in the stiffness between the treatments that used an equal volume of cement, as we first hypothesized. However, the difference in strength between CR repairs and BS and BS+2 repairs in the thoracic region were significant, but differences between CR repairs and BS or BS+2 repairs in the lumbar region were not. The CR repairs were stronger, and the lack of statistical significance was likely a type-II error (P = .07, β = 0.50). Failure in both treatment groups occurred at similar deformations. This observation indicated that, despite differences in repair strength and stiffness, one group was not more prone to compressive deformity at failure than another. On average, all treated VBs were notably less stiff than they had been in their initial states. Stiffness is a measure of the amount of VB compression in response to a given applied load. Restoring stiffness near its original value is theoretically desirable, and this restoration would prevent excessive motion in response to applied loads and yet avoid stress shielding (12). Although PV usually restores or nearly restores the initial stiffness of the VB when polymethylmethacrylate cements are used (3, 5, 12), the observation that none of the treatments restored stiffness in the current study was not unexpected. Two primary reasons may account for this finding. First, the volume injected in the current study was less than that used in previous studies, and the composition of the cement was altered. In the current study, 4 and 6 mL were injected in the thoracic and lumbar VBs, respectively. These amounts were based on a previous report that such volumes were sufficient to restore stiffness (12). The data in the previously mentioned study were obtained by using Simplex P, which, unaltered, is stronger and materially stiffer than Cranioplastic (4). Therefore, it would be expected to result in stronger and stiffer repairs than Cranioplastic for a given volume of cement. In a previous study, 8-mL injections of Cranioplastic did not restore the initial stiffness of the VB (14). Furthermore, when Cranioplastic is prepared in a manner consistent with the practice of PV, the strength and material stiffness (modulus) are further reduced (15). In fact, when altered for use in PV (8), Cranioplastic is the cement with the lowest material properties of the cements commonly used for PV (4). Nevertheless, the altered form of Cranioplastic has been used for PV in the United States far longer than any other cement, yet no incidence of complications associated with mechanical failure of the cement is reported (8). Because of this extensive clinical experience with Cranioplastic for PV, we chose to use the mechanical restoration provided by Cranioplastic as the benchmark (control) against which the responses with the BoneSource repairs were compared. The results of the current study suggest that mechanical repairs with equal or greater volumes of BoneSource may provide repair results similar to those obtained with Cranioplastic. Although increasing the volume of BoneSource by 2 mL increased the strength and stiffness of the repair, the increase was not significant. This finding was contrary to the second hypothesis in which significantly more strength and stiffness was expected secondary to the increased volume of BoneSource. Whether the additional 2 mL of BoneSource provides any other benefit is unknown. Increasing the volume of cement may increase the risk of extravasation of cement, which is not an infrequent occurrence in PV (8, 16–18) and does present a potential risk to the patient (19). Hydroxyapatite materials have the potential advantages of being osteoconductive, not exothermic, and naturally radiopaque, and they have none of the potential deleterious effects of a monomer (20, 21). Although concern about thermal and chemical damage has diminished (2), the potential advantages of osteoconductivity and natural radiopacity have sustained interest in developing such materials for PV. However, the durability of a BoneSource repair after resorption and remodeling occur is unknown. The region around the cement could possibly weaken during resorption and therefore be prone to fracture. Also, the resorption process may stimulate local remodeling, resulting in greater strength for the repaired VB. Similarly, the long-term effect of vertebroplasty with polymethylmethacrylate in local remodeling is unknown. Currently, the role of vertebroplasty is to internally stabilize compression fractures and thus prevent pain and allow the fracture to heal. The long-term effects after fracture healing are not yet known. These questions can be answered only by performing a clinical investigation of osteoporotic compression fractures treated with BoneSource. This research was supported by a grant from Stryker-Howmedica-Osteonics, Mahweh, NJ. Accepted after revision August 5, 2002.